The Sacred Way connected the city of Miletos to the sanctuary of Apollo at Didyma and has long been considered one of the best-documented examples of a processional road from the ancient world. Many doubts remain about its historical development and exact route, however. The road seems to have been a conduit for religious festivals and their associated processions, as well as providing access to a number of sacred sites between Miletos and Didyma in the so-called Akron hills. Some have claimed that the earliest processions along this route date to the 6th or 7th centuries BCE (i.e. around 2700 years ago), but the name or concept of a “Sacred Way” may not have been used until the 2nd century BCE (i.e. ~2200 years ago). Later, around 101-2 CE (i.e. 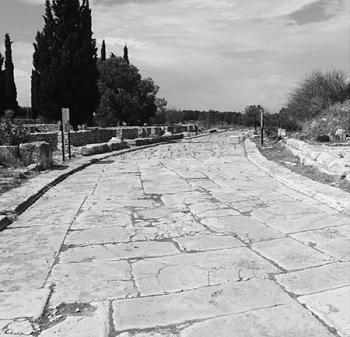 about 1900 years ago) the Roman emperor Trajan funded an extensive programme of re-building of the Sacred Way which resulted in the paved section of road which today can be seen uncovered at Didyma. 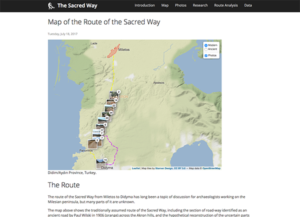 A re-analysis of the evidence relating to the Sacred Way was published by Panormos team members in 2018 in the American Journal of Archaeology (link to open access pdf), alongside an associated web site (link to Sacred Way website) with photographs and code-based explanation of the route modelling. Toby Wilkinson, 2018. Project Panormos: Modelling the Sacred Way; 27 Mar 2018. <http://www.panormos.de/pp/sacred-way/> accessed 22 Apr 2019.